The most functional bionic hand ever created for prosthetic use was developed by Touch Bionics, a British prosthetics company that just received the 2008 Royal Academy of Engineering MacRobert Award. 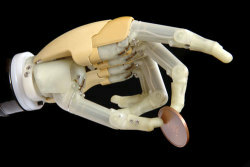 The new bionic hand is called the i-LIMB Hand. The i-LIMB Hand brings great news to hand and finger amputees who, prior to now, have not been afforded much function in their prosthetic hands, especially in the area of finger control. The new technology employed by the i-LIMB Hand uses a dual-imput myoelectric signal (muscle signal) to open and close the hand and new multi-articulating finger technology. The i-LIMB Hand may also be fitted for those who have lost just parts of their hands. Because the i-LIMB Hand enables fingers to move independent of each other, it gives the prosthetic user many different grips and holding abilities, enabling most functions of daily living to be completed by the user. This opens new doors and expectations for rehabilitation. 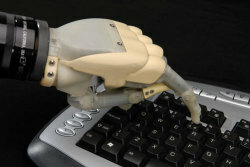 For example, this state-of-the-art bionic hand allows the wearer to hold a cup of coffee, grasp a dime or a weight bar, shake hands, point a finger to show direction, use the index finger to operate a computer, hold a cell phone, and open a door with a key.... Until now, bionic hands were not able to accomplish all of these tasks. Recently, Touch Basics acquired LivingSkin, the company that makes a very realistic skin that Touch Basics uses on its prosthetic devices. LivingSkin is available to cover the hand, as are colored skins or gloves that protect the i-LIMB Hand from getting dirty or dusty. The i-LIMB Hand is already on the market, being used to fit military amputees from Iraq and Afghanistan, as well as non-military amputees throughout the world. Japanese Ogori Cafe: Would You Dine Where Every Meal Is A Surprise?